Vitamin C's health-maintaining functions and health-restoring capabilities are well documented. Both scientific as well as medical researchers have recorded decades of vitamin research, clinical progress and success. Small doses of vitamin C can heal scurvy - an ancient disease caused by dietary deficiency of vitamin C - the general symptoms are weakness, anemia, gum disease, skin hemorrhages and, finally, death - if left untreated. Large doses have health-restoring capabilities healing patients suffering from cancer, serious infections or an overload of toxins. This powerful antioxidant neutralizes harmful elements within the body, stimulates the absorption of non-heme iron and thus reduces the iron deficiency; and strengthens your immune system. Vitamin C may help chemo and radiation kill cancer cells while protecting your healthy cells from harm. Cancer: Nobel Prize Winner Dr. Linus Pauling and Ewan Cameron began an experiment with 1100 terminally ill cancer patients. 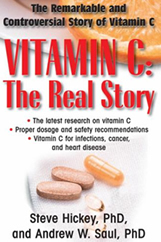 The results were that the 100 patients taking vitamin C had lived four times as long as 1000 control patients who received no added vitamin C. Not only did the Vitamin C prolong their lives, but also the quality of their lives was greatly improved during the time they did live. One major benefit was the freedom from pain. "I never cease to be amazed at the number of persons who remain unaware that vitamin C is the best broad-spectrum antibiotic, antihistamine, antitoxic and antiviral substance there is." Heart Health: Vitamin C is essential for the building of collagen - the major component of connective tissue. [Wolbach, S. B.., and Howe, P. R. Intercellular substance in experimental scorbutus" Arch. Path., 1:1, 1926] ... This connective tissue has structural and supportive functions which are indispensable to heart tissues, to blood vessels. No heart or blood vessel or other organ could possibly perform its functions without collagen. No heart or blood vessel can be maintained in healthy condition without vitamin C.
Young & Healthier Skin and Hair: The collagen that keeps our heart and blood vessels healthy also gives our skin its strength and resiliency. Prolonged exposure of cultures of human connective-tissue cells to ascorbate (Vitamin C) induced an eight-fold increase in the synthesis of collagen (Murad et al., 1981). It also disarms free radicals that would otherwise destroy or weaken collagen. Nutritional epidemiologist Maeve Cosgrove and other co-researchers have discovered that those who consumed plenty of Vitamin C-rich foods had fewer wrinkles as compared to those whose diets carried little of the vitamin. Bone Health: Vitamin C is required for the production of collagen, which is also a component of bone tissue. Moderate to severe knee osteoarthritis is on the rise due to an aging population and increasing rates of obesity. A recent study suggests that fruits with a high vitamin C content can improve bone health of the knee. In a 10-year study of nearly 300 healthy adults, researchers found that an increased intake of Vitamin C was linked to a 50 percent less risk of bone marrow lesions, important markers in the pathogenesis of knee osteoarthritis. Weightloss: A study led by nutrition researchers from Arizona State University found that too little vitamin C in the blood stream correlates with increased body fat and waist measurements. The scientists report that the amount of vitamin C in the blood stream is directly related to fat oxidation – the body's ability to use fat as a fuel source – during both exercise and at rest. The controlled four-week study involved 20 obese men and woman. Half of the participants were given a 500 mg vitamin C capsule daily and the control group took placebos. Heavy Metal Poisoning: Vitamin C is a surprisingly good chelator. Researchers from the University of California, San Francisco looked at blood levels of lead and ascorbic acid (vitamin C) and found that those with the highest levels of ascorbic acid were 89 and 65 percent, respectively, less likely to have elevated blood lead levels. Some physicians with experience of heavy metal toxicity will administer intravenous Vitamin C to get mercury out as quickly as possible, as this antioxidant helps to minimize the impact of mercury entering the bloodstream after diagnosed mercury toxicity or after the removal of amalgam dental fillings. NOTE: Individuals who are suffering from Hemochromatosis should realize that Vitamin C increases the amount of iron absorbed from foods which puts them at risk of excess iron in their blood. Any supplementation with Vitamin C should, therefore, first be discussed with health care providers. On the other hand - since Vitamin C stimulates the absorption of non-heme iron it reduces iron deficiency in those suffering from it. High-Dose Vitamin C Therapy PROVEN Effective - "My doctor doesn't believe in vitamins." Vitamin C and Acidity - What Form is Best? Vitamin C and its role in Antiaging!